Having been an elected politician, Paul is a highly experienced public speaker. He also provides facilitation services for conferences and private meetings. Specialist topics include the impact of Brexit on Northern Ireland; the economic and political environment in Northern Ireland; the financial crisis that hit The Co-operative Bank and Co-operative Group; and the book Abuse of Trust. * Spoken at CIMA’s Belfast conference on the impact of Brexit. * Spoken at the BDO Northern Ireland/Londonderry Chamber of Commerce breakfast conference on the impact of Brexit. * Spoken at Cork University’s conference on credit unions, explaining the crisis at The Co-operative Bank. * Facilitated a private meeting of business organisations on the impact of Brexit. * Facilitated a private meeting of companies in a specific sector with a government minister on the impact of Brexit. * Spoken at the AGM of Progressive Co-operators on the crisis at the Co-operative Group and The Co-operative Bank. * Spoken at the AgendaNI conference on the state of the Northern Ireland economy. * Spoken at a Common Purpose event, discussing the economy of Derry. * Given a talk on the massive scale of child sexual abuse at a launch of the ‘Abuse of Trust’ book. 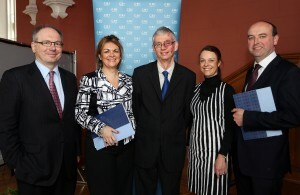 * CBI/EURES conference at University of Ulster Magee campus on state of Northern Ireland economy. * University of Cambridge, Department of Engineering, on problems with Private Finance Initiative and Public Private Partnerships. * Ways Forward Conference on the crisis at the Co-operative Group and at the Co-operative Bank. * Plenary speaker at Society for Co-operative Studies Annual Conference on the problems at the Co-operative Group and Co-operative Bank. * Mutuo conference on the state of the co-operative sector. * Induction meeting for sales staff of bank on state of the economy. * UNISON conference on the future of social care and the privatisation of services. * Briefing to company board on state of the economy and the likely impact on its sector. Paul is a former part time lecturer at the Co-operative College and was an occasional lecturer at Leicester Polytechnic (now De Montfort University). In the run-up to the EU membership referendum, Paul debated with People Before Profit on the vote – arguing strongly against Brexit. A video of Paul’s speech can be seen here. ×You can get in touch with Paul by going to the Contact page.